Following hot on the heels of the gangbuster opening weekend of Felons Brewing Co., the Howard Smith Wharves precinct is looking to go two-for-two with its brand-new bar Mr Percival’s. An adventurous architectural endeavour, this world-class octagonal bar and eatery sits above the lapping waters of the Brisbane River, uniting European flair with a resonant Brisbane-inspired familiarity. Mr Percival’s officially opens its doors at 8:00 pm tonight, Thursday November 29, but we’ve got a the sneak peek inside for you ahead of another record-setting weekend. If you’ve ever read the cherished Australian novel Storm Boy, then the name Mr Percival might ring a bell. The peculiar pelican was a central figure in the moving tale – a creature of air, land and sea. Now this literary figure shares its name with Howard Smith Wharves’ brand-new locale – a venue utilising the same three elements as part of its identity. 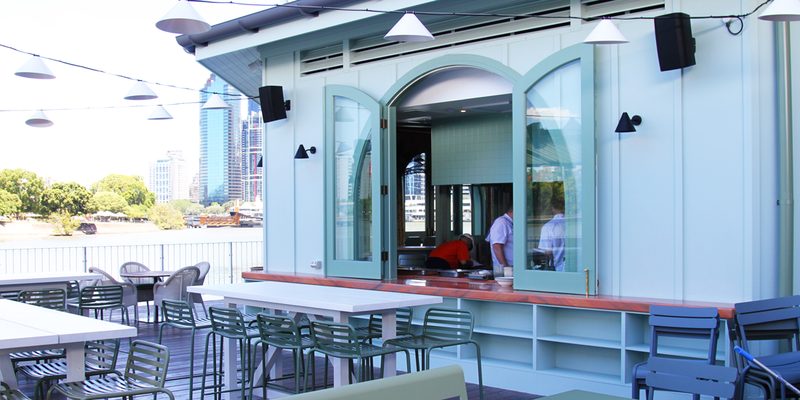 Mr Percival’s is the newest opening for the booming leisure precinct, positioned directly underneath the canopy of the Story Bridge on a 600-sqm wharf deck above the Brisbane River. The idea first blossomed while Howard Smith Wharves founder Adam Flaskas was gallivanting around Europe, soaking up the atmosphere across the continent’s varied beach clubs. Inspired by the potential of engaging with the Brisbane River to spur a sense of eternal summer, Adam incorporated the idea of an overwater bar into the early drafts of the Howard Smith Wharves – never wavering from the vision of a world-class venue that segued between European style and Australian charm. 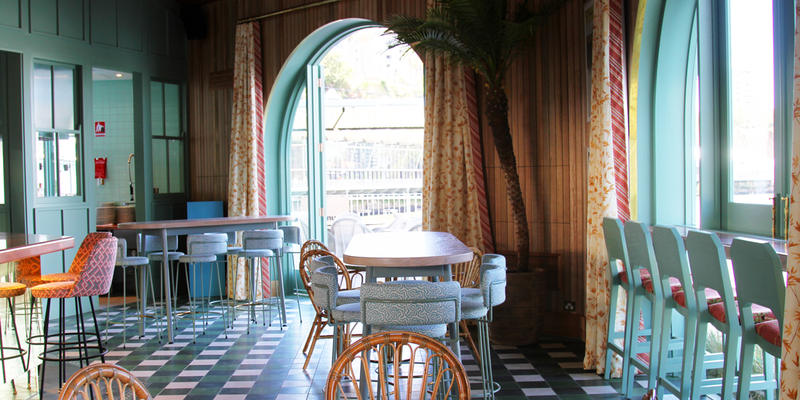 As if creating new real estate on top of the water wasn’t ambitious enough, the team behind Mr Percival’s has endeavoured to make the decor and atmosphere completely unique. The Howard Smith Wharves group enlisted accomplished interior designer Anna Spiro to shape the venue’s vibe, entrusting her with the task of bringing to life a space that was quintessentially Brisbane. Mr Percival’s interior is soaked with colour – pops of sea foam, yellow, green, pink and blue are liberally splashed across printed furnishings, Maison C wallpaper, floor tiles, round lights from Douglas & Bec and patterned curtains. The octagonal space draws parallels to the airy rotundas of New Farm Park – each angle is poised to draw in errant breezes. Timber walls made from Victorian ash are offset by the bar, which has been constructed with pink granite, brass and mirrored backsplashes, creating a vibrant textural interplay. Photographer Tim Salisbury was engaged to create a photo series of classic Brisbane imagery, with works depicting riverside scenery adorning the walls. Finally, the wrap-around deck affords plenty of space to enjoy the river views of the New Farm cliffs, Kangaroo Point and Brisbane City. Head chef Damien Styles (formerly of The Fish House) has worked with culinary director David Finlayson and Howard Smith Wharves’ executive chef Patrick Friesen to formulate the Mr Percival’s menu, which spotlights quality seafood across a range of light meals and aperitivo-style snacks – all imbued with a sprinkling of European influences. 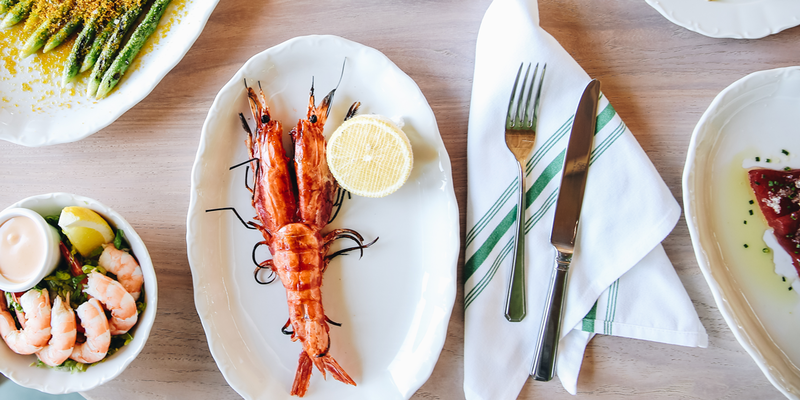 Diners will be able to savour fried and stuffed zucchini flowers, lobster rolls, whipped cod roe and warm baguettes, anchovies with olive oil, lemon and garlic, and much more. General manager of food and beverage at the Howard Smith Wharves Lance Burrows has relocated to Brisbane after stints at the Merivale group, bringing his experience to help spearhead Mr Percival’s bar offering. A list of 17 cocktails will be available (including several variations of the spritz), in addition to a selection of 50 wines with a small, artisanal focus (rosés and crisp whites are a specialty). The core range of Felons Brewing Co. beverages features across the bar’s beer taps, while an impressive selection of spirits adorn the tiered back bar. Mr Percival’s opens tonight at 8:00 pm. For more information, check out the Stumble Guide.